Standing around eight stories tall, the five-stage rocket is set for liftoff during a four-hour launch window opening at 11:15 p.m. EDT Friday (0315 GMT) Saturday from Complex 46 at Cape Canaveral Air Force Station, Florida. Here is a diagram of the Minotaur 4’s flight sequence, and a list of major events during the rocket’s ascent into space. T+00:00 — Liftoff: The first stage’s decommissioned Peacekeeper SR118 solid rocket motor ignites to begin the Minotaur 4 rocket’s mission. Pitch and roll commands two seconds later will put the rocket on the proper trajectory. T+00:36 — Max-Q: Aerodynamic pressure on the vehicle reaches its peak as the Minotaur 4 accelerates through the lower atmosphere. T+00:56 — Stage 1 Separation/Stage 2 Ignition: At an altitude of 16 miles, the rocket’s ATK-built solid-fueled first stage exhausts its supply of propellant and is jettisoned. The second stage’s SR119 motor ignites to continue the flight toward space. 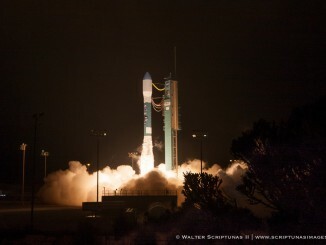 T+01:54 — Stage 2 Burnout: The second stage SR119 motor, built by Aerojet Rocketdyne, burns out at an altitude of 58 miles. T+02:05 — Stage 2 Separation/Stage 3 Ignition: After a 15-second coast, the Hercules SR120 third stage motor fires for a 72-second burn. T+02:24 — Fairing Jettison: The 92-inch graphite-epoxy aluminum honeycomb payload fairing that protected the satellites during the ride through the lower atmosphere is jettisoned as the rocket ascends into space at an altitude of 81 miles. 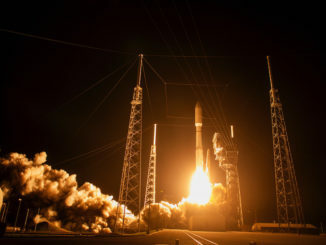 T+03:17 — Stage 3 Burnout: The Hercules SR120 motor completes its burn and the Minotaur 4 enters a coast period lasting more than 10 minutes, during which the vehicle’s altitude will soar to more than 350 miles. T+13:44 — Stage 3 Separation: The Minotaur’s third stage is released to re-enter Earth’s atmosphere. T+13:55 — Stage 4 Ignition: An Orion 38 solid rocket motor is ignited to deliver the ORS-5 satellite and three CubeSat secondary payloads into a preliminary parking orbit between 248 miles and 372 miles (400-600 kilometers) in altitude at an inclination of 24.5 degrees. 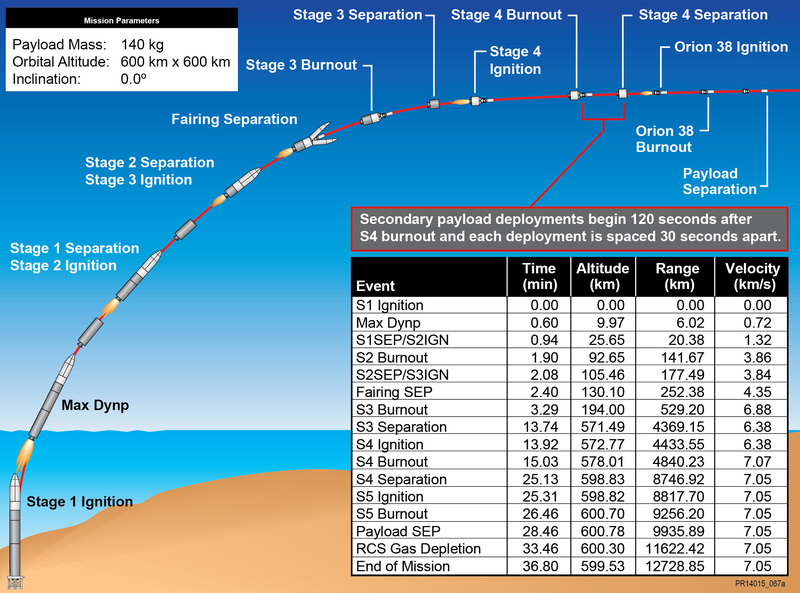 T+15:02 — Stage 4 Burnout: The fourth stage Orion 38 motor uses up its propellant and burns out as it enters the targeted elliptical parking orbit, beginning a 10-minute coast phase. 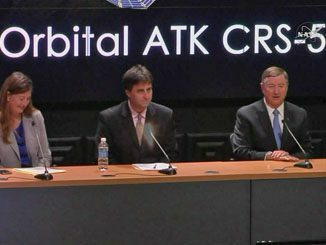 T+17:02 — Begin CubeSat deployments: Three U.S. government CubeSats begin deploying from the Minotaur 4, separating at 30-second intervals. T+25:07 — Stage 4 Separation: The fourth stage Orion 38 jettisons in preparation for ignition of the fifth stage Orion 38 rocket motor, a segment added to the Minotaur 4 to direct the ORS-5 satellite into its unique equatorial orbit. T+25:18 — Stage 5 Ignition: The fifth stage Orion 38 motor ignites for a 69-second burn. T+26:27 — Stage 5 Burnout: The Orion 38 motor burns out after reaching a circular 372-mile-high (600-kilometer) orbit over the equator. T+28:28 — ORS-5 Separation: The 249-pound (113-kilogram) ORS-5 spacecraft separates from the Minotaur 4’s fifth stage.